Hello! New Media Capstone students here, and we are extremely excited to introduce to you our new app, MOVE. But before we get started, did you know that over half of all college students don’t exercise? It follows as no surprise that the average freshman gains about 7½ to 9 pounds after their first year of college. In fact, USA Today reported that college students gain an average of 10 to 14 pounds total during their full college career. Because of this, our group wanted to tap into the gaming aspect of exercise so it doesn’t seem like such a daunting task for young adults. This is what inspired us to create MOVE. 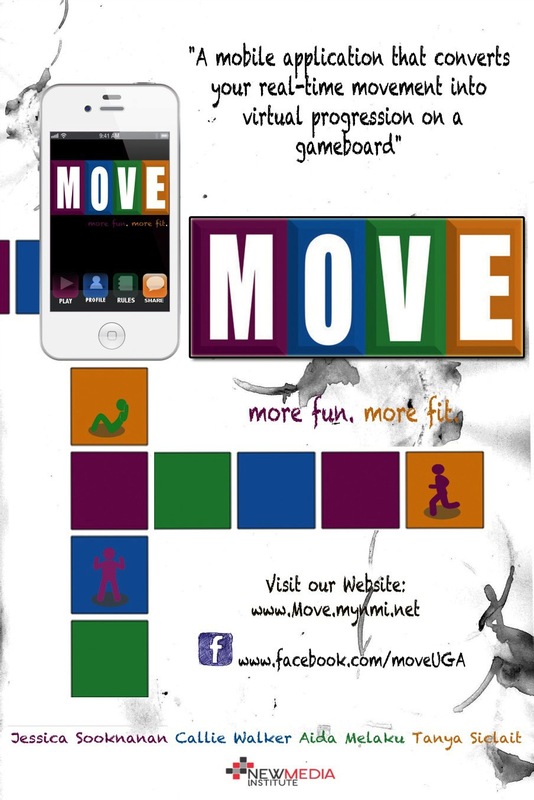 “So what is MOVE?” you may be asking yourself..
MOVE is a virtual game board designed to encourage exercise and movement among young adults. Using a built-in accelerometer, the mobile app will measure movement and reward players for the amount of activity they perform. Players will begin the game by choosing a character to represent them on the game board. As the player exercises, the character will move across the game board until he or she completes the course! Sound easy? Think again! The game cannot be completed during a single workout, and any periods of inactivity will result in player penalization. If the player does not move for excessive periods of time, the character will be moved back several steps on the game board. Need some more incentive? Challenge your friends to see who can complete the course the fastest!